I help institutions and individuals organize, understand, and share observations and ideas about places; to understand how places work in their context; so that people can more effectively collaborate, make more informed decisions, and appreciate the quality of places as are, as they change or may be changed. I have trademarked a short phrase that captures this mission: cultivating spatial intelligence. Lets take observations and ideas from multiple points of view and make them stick together in useful ways! New! Boston Planning and Development Agency launched its city-wide 3d model. pbcGIS developed this model from various sources, and developed turn-key workflows for managing a collection of models for every buildng in the city, including historic buildings that don;t exist any more through buildings that have been proposed, approved, rejected and undr-construction. pbcGIS also developed the tools for tiling the cyty-wide model into 1-kilometer square sketchup models that include detailed terrain, groundp-plan and buildings. This is very similar to the set-up we made for Cambridge, last year. Tomorrow the world! View the Boston City-Wide 3d Model in your browser. Download our model in many open 3d formats via the pbcGIS tiled download system! The big idea behind these city-modeling projects is to provide a smoother interface between the world of urban design and development with the data-management culture of municipal GIS. When this succeeds, designers and planners in quickly-developing areas like Boston and Cambridge will have a common-operating-picture of the near-future city that includes projects that are in the design-review pipeline. Under the covers, the work behind these city models is much more than ordinary data-wrangling. It is hard enough to create a city-wide model as a snap-shot. But to be a sustainable, maintained city-model requires a structure for integrating data from lots of sources and levels of detail, automatically-generated building models of existing terain and buildings conditions, which are up-dated from time-to-time. and hand-made renditions of proposed buildings. Unexpectedly, the difficult thing about developing a system for managing the models through time, requires a sensible, intuitive organization for the files and tools. The system has to scale without becoming more complicated as more and more new and historical data accumulates. The model systam also scales as additional city models are added or models for in-hlodings such as campuses. Our new data model does this quite well and is still simple and intuitive to figure out where any nw piece of information should be filed or where any old piece of information about a particular place and time, can be found. Stay tuned for the How to Organize your City Model Handbook! Cambridge Historical Commission Building Files: Digitize, Catalog, Expose, Explore, Preserve. pbcGIS developed an architecture an on-line archive of its collection of 16 file cabinets full of ephemera and official documents about Cambridge Buildings. STand by for phase 2! View Studies of a Project in Harvard Square, Massachusetts. Cambridge City-Wide 3D Model Downloadable as SketchUp Tiles! Handbook for Information Stewardship for Cultural Heritage Preservation: Strategies, Tools and Standards. Funded by the Boston Architectural College and the U.S. Department of State. The Rhino Terrain tutorial has been upgraded with new demo dataset, and now a video! The Buildout Calculator for SketchUp is now a FREE DOWNLOAD! 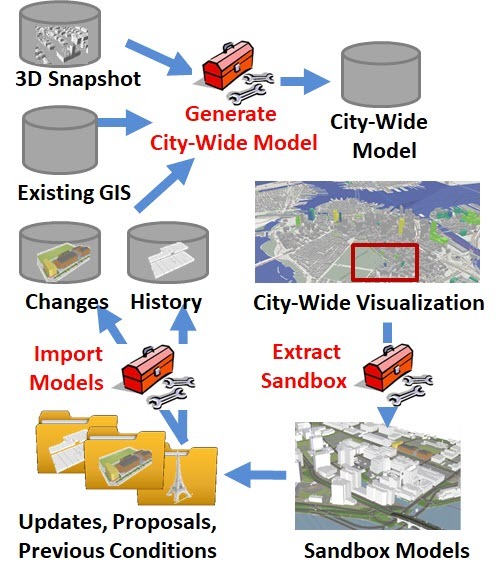 Data Model for a Living 3D Model of the Boston Metropolitan Area Presented at the 2015 ESRI Geodesign Conference. Video and 3D webScenes of Boston! Introducing City Modeling Services for Municipal Government. Four City Engine Workshops conducted for staff from Cambridge, MIT, Harvard and Boston. City Engine Tutorials with sample datasets are now free and open to the world wide web! Architecture for a Living City-Wide 3D Model Slides presented at the Northeast ArcInfo User Conference with Jeff Amero, GIS Director of the City of Cambridge. Detailed Flood Simulation. Uses a very detailed Cambridge/Boston terrain model and logic that considers the delay of inundation of areas that sit behind higher elevation terrain features. Download this PDF and view it in Actobat to enjoy the animation. 2010: A Cybernetic View of Studio. Applications of collaborative city modeling explored in a course at the Harvard University Graduate School of Design. 2009: Where are Sampson and Goliath? 3D Experiments with the Belfast Skyline. Published in the May 2009 Issue of GeoWorld Magazine. 2009: Urban Design Laboratory for Belfast, Northern Ireland . Prepared for Ulster University School of Architecture with Richard Sommer. 2008: Adapting the Town of Brookline’s GIS Infrastructure for Managing Three Dimensional Models. 2007: Web Services Architecture for CAD GIS and BIM. Open Geospatial Consortium Discussion Paper summarizing the the Fourth Open Web Services Testbed CAD, GIAS and BIM Thread; Architect and Editor, Paul Cote. 2006: Understanding Threatened Urban View Corridors with LIDAR Data. Presented at the ESRi User Conference, Palm Springs, California. 2005 Practical Framework For a Collaboratively Developed, Multi-Purpose 3D Model of the Metropolis. Presented at Computers and Public Management, University College London. 1998 The Metadata Collection Parser Working tools for automated catalog harvester for collections of geographic data. 1996 Slides from a presentation on Data Management for Broad-Sacle Landscape Research. With Carl Steinitz, Stephen Ervin and others. Creative Commons Attribution-NonCommercial-ShareAlike 3.0 Unported License by Paul Cote.